"Ventilation shutdown” is also used to kill healthy birds and prevent the spread of the flu. It raises the barn temperature to at least 104F for a minimum of three hours killing the entire flock—a method so extreme that even factory farmers admit it is cruel. During the 2015 outbreak, “Round the clock incinerators and crews in hazmat suits,” were required for the bird depopulation reported Fortune—a sequence likely to occur again. In addition to hiding the round-the-clock suffocation of birds to prevent bird flu’s spread, factory farmers assure the public that bird flu is not a threat to humans so people should keep eating their products. Sadly, their claim is not totally true. 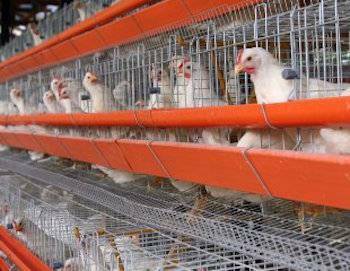 A bird flu outbreak exposes the unethical and deceptive practices of poultry producers. Once again, bird flu is back in the U.S. From 2014 through mid-2015, 48 million chickens and turkeys were killed in the U.S. to prevent the disease’s spread and protect famer’s profits. Factory farmers routinely fight to keep images of how poultry are raised out of public view, so consumers do not lose their appetites and will continue eating their products. Industrial farmers also fight hard to keep images of how chickens and turkeys are “euthanized” out of the public view. Factory farmers like to blame bird flu on “migratory birds,” denying that high-volume production methods allow the spread of the disease. But the fact is, factory farms house 300,000 or more egg layers in one barn versus only tens of thousands of birds in “broiler barns” which is why the flu spreads so quickly among egg-laying hens. Moreover, we the taxpayers compensate factory farmers for their self-induced losses and appalling farm practices. "The poultry industry appreciates the fact that the USDA helps protect the health of the nation's livestock and poultry by responding to major animal disease events such as this," said a letter from the National Association Egg Farmers to Catherine Woteki, Under Secretary for Research, Education and Economics during the previous bird flu outbreak. But please "provide indemnification for the whole flock and not just the surviving," the letter asks. The only interaction most people have with poultry production is the prices they pay at the grocery store. When prices are low, people do not think twice. When prices jump—as they likely will with the new bird flu outbreak—few realize the higher prices are a direct result of the conditions that make low prices possible because they invite disease. During a bird flu outbreak, the unethical and deceptive practices of poultry producers are in full view. Yet, it is not hard to find healthy, protein-packed alternatives to factory farm-produced poultry products. By doing so, the U.S. public sends a strong message to poultry producers.